After interviewing BBC Apprentice 2015 winner Joseph Valente and BBC Apprentice 2016 winner Alana Spencer, I couldn’t definitely miss the two BBC Apprentice 2017 winners. Yep – as you may have heard, both IT recruiter James White and confectionery store-owner Sarah Lynn scooped the prize last year, so The Apprentice got two winners for the first time in history. But I have to be honest: at first sight, there were other candidates and business ideas I liked more. Winner Sarah Lynn, who runs a confectionery repacking company, made me suspicious at first because she compared Lord Sugar to a lemon sherbet, but – as the weeks passed by in the series – I had the chance to appreciate her amazing personality. She’s clever, calm and focussed. She’s just the kind of person I would aspire to be if I were not my start sign. I will definitely host Sarah with great pleasure for a Frank Interview as soon as her sweets business gets launched. 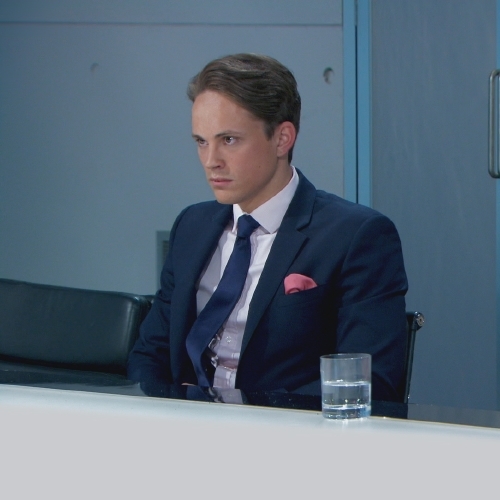 As for James White, who is now the director of Right Time Recruitment in Birmingham, he scored a perfect 0/10 in my BBC Apprentice 2017 Player’s Ratings last October. You know what – I might have amended the score after he won like any blogger would – thankfully I’m not a blogger – but I actually wanted to punish him for his BBC Apprentice audition, where he stated that he’s a very good-looking guy and would rate himself 9 out of 10. However, at the end of the day, I had to admit that – exactly like Sarah – James is an amazing team player and salesperson; I liked the way he always performed his job well without bitching around nor accusing the other contestants. And these are crucial skills in business, so bravo James. Also, after speaking to him, I must say he’s got a decent sense of humour that may not have appeared on the telly. But before you start reading my interview with James, I would like to thank Andrew Bloch and the Frank PR team for their great work and availability. Hey James, congratulations for winning. Good. Thanks. How are you? Good. So, how does it feel to win The Apprentice along with another candidate? I guess… well, obviously it feels fantastic ’cause obviously I wanted to win and it’s also nice to win along with someone I have a lot of respect for as well… and you know, it’s up to him [Ed. Note: Lord Sugar] to evaluate, and we’ve got two completely different businesses, so yeah, I’m happy. Ye-ah. Did you want to be a recruiter? Maybe you wanted to be a football player…? Haha – you know what, I couldn’t really think of anything – I just wanted to do what led to money – so anything related to money was fine. How did you realise you didn’t want to be just a regular employee – that you wanted to work for yourself? Well, yeah. I think money was what would drive me a lot of times. I didn’t want to work for someone else’s money and not for myself, so I decided that the right thing to do was to work for myself. What tips can you give to someone struggling to find their way between regular employment and self-employment or business? My tip would be: know your industry, get your contacts there first. Like, you know, I worked in recruitment for four-and-a-half years before I started my own business, and that gave me the basics to have solid skills in the industry: if you’ve got no experience, it becomes ten times harder. So, even if it’s going to take a bit longer to get your business going, go and get the experience you need first. If you were not a recruiter, what would you be doing right now? What was your plan B? Being on a beach somewhere. Hahaha. Well, mostly: that’s my natural skill… so I’d say yeah, I would still be some kind of salesman.